Spiralisers are great for adding a twist to potatoes too. 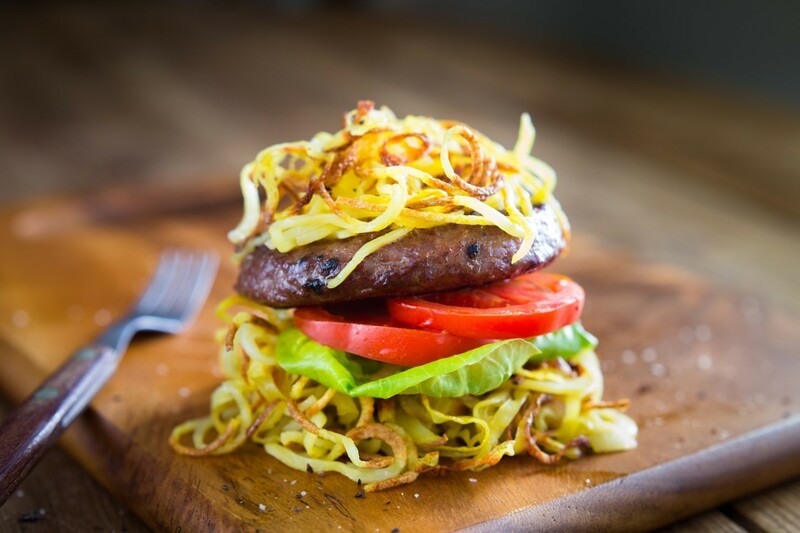 Here’s a gluten-free way to make your burgers a bit more special by using spiralised potatoes to make ‘buntatoes’. 1Wash and pat dry your potatoes, then spiralise them (no need to peel first). 2Place the spiralised potatoes onto an oven tray which has been lined with greaseproof paper. Coat lightly with olive oil and sprinkle with a little salt and pepper. Cook at 190°C / Fan 170°C / Gas 5 for around 30 minutes, occasionally turning gently so they cook evenly. 3Meanwhile cook your burgers and prepare your trimmings. 4Arrange half of the spiralised potato into neat piles on the plates. Top each pile with a burger and trimmings then top with more spiralised potato. Voila!